Bass Everywhere but too shallow for the big boats! Matt and Tim hit the water in Old Town's Predator PDL Kayaks in search of big bites in ultra shallow water. Come along as they adapt to a new fishing style and succesfully power fish the shallows. The bass were crushing frogs, buzz baits, and creatures. Using these power techniques while standing on a small platform presents unique challenges but the guys adapted to the conditions and continued to put fish in the boat. They've got a long way to go but Day 1 on the Kayaks was a success. Do Red Hooks, Feathered Trebles, and different retrieves make a difference? Matt explores these tricks and more as he teaches how to catch more topwater bass this late Summer and early Fall. Do you want to catch bigger bass on top? This will make all the difference! 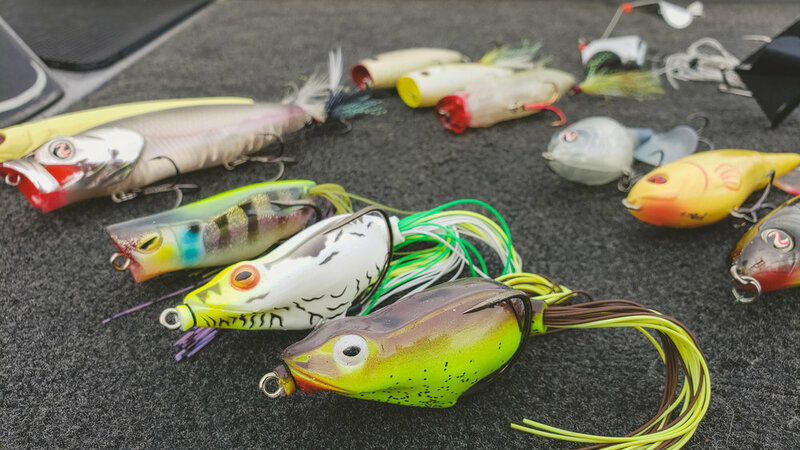 As Spring turns to Summer the bass become more wary of topwater lures. As Summer fades to Fall it can be downright tough to fool the bigger fish. Making these subtle changes will maximize your opportunities and in some cases, will actually get you more bites. From the first cast to the last, these bass were chewing! When you hear guys talking about frog fishing, these are the bites they dream about! Throw in a variety of tips about adapting frog fishing to your style instead of trying to fit yourself into the frogging mold, and this video is sure to help your fishing! Matt has been struggling with his hookset as he regains strength after his accident. Instead of fighting it and continuing to lose fish he switched to smaller frogs and softer rods and was able to executive much more efficiently. This method works for anyone of smaller stature or anglers that are young/old that struggles to get a strong enough hookset for frog fishing.